This travelling exhibition introduces Our SG Heritage Plan, the first masterplan to chart the direction of Singapore’s heritage for the next five years and beyond. As our cultural legacy involves everyone, we want to reach and hear from as many as possible. 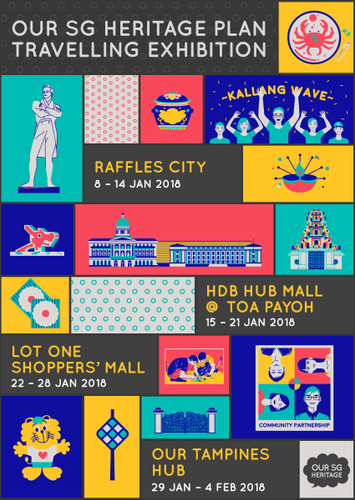 The exhibition will travel across the island to Raffles City, HDB Hub Mall @ Toa Payoh, Lot One Shoppers’ Mall, Our Tampines Hub, and National Museum of Singapore from 8 January to 19 February 2018. Members of the public will get to join our conversation on heritage, by sharing their thoughts and suggestions at the exhibition’s feedback stations. Find out more at Our SG Heritage Plan website and connect with us at #OurSGHeritage.